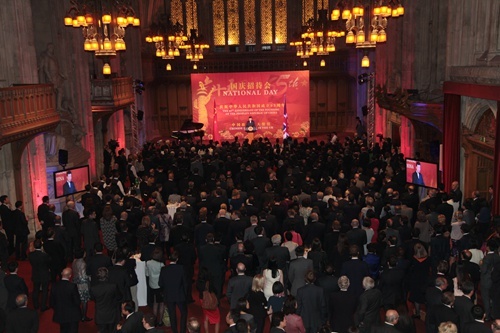 On the evening of 23 September 2014, the bright China red illuminated the more than 600 year old City of London Guildhall. This medieval landmark witnessed numerous big events in the British history, and today it ushered in a grand Chinese event: the 65th National Day Reception hosted by Ambassador Liu Xiaoming and Madame Hu Pinghua. Presided over by Minister Ni Jian, the reception was attended by over 600 guests from all walks of life, including Minister of State for Foreign and Commonwealth Affairs Baroness Anelay, Parliamentary Under Secretary of State for Natural Environment, Food and Rural Affairs Lord de Mauley, Vice Chief of the Defence Staff Air Chief Marshal Sir Stuart Peach, Co-Chairman of the Asia Task Force Lord Powell, Lord Mayor of Westminster Audrey Lewis, Leader of Westminster City Council Philippa Roe, former Minister of State for Foreign and Commonwealth Affairs Lord Howell, former Solicitor-General for Scotland Lord Davidson, foreign envoys in the UK and representatives from China-funded institutions in the UK. Along with the beautiful tune of welcome, the guests gradually arrived. 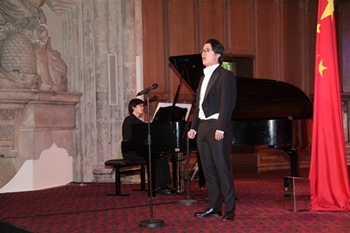 At 7:00 pm, the reception started with Chinese and British national anthems ringing throughout the venue. 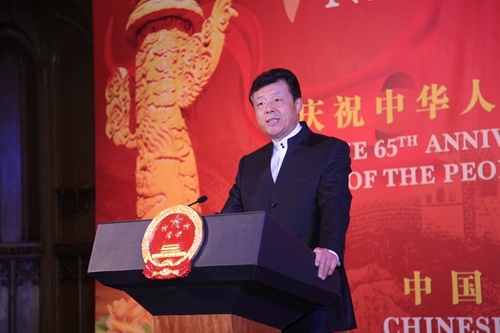 Ambassador Liu delivered a warm speech in front of the huge backdrop reading “The 65th Anniversary of the Founding of the People’s Republic of China” in both Chinese and English. Ambassador Liu said over the 65 years, China not only succeeded in providing for the basic needs of its people but also becoming the world’s second largest economy. China not only ended the scourge of war and poverty, but also found a path suitable to its development. China not only actively integrated itself into the world, but also made outstanding contribution to world peace and prosperity. Ambassador Liu gave examples of the new figures of development and new speed of advance in the social and economic development of China: China’s foreign trade last year totaled 4.16 trillion US dollars, ranking the first in the world; 100 Chinese companies rank among the Fortune 500, reaching a record high; the Industrial and Commercial Bank of China is now the world’s largest bank; The IPO of Alibaba, a private company from China, sent global investors into a frenzy; China has become the world’s largest applicant of patents; as the world’s largest investor in clean energy, China ranks the first in the world in wind power capacity and solar power capacity; China’s high-speed railway makes up almost half of the world’s total; China has the most nuclear power generators under construction in the world; with nearly 100 million outbound tourists, China became the world’s largest source of outbound tourists. In 2013 Chinese tourists spent 102 billion US dollars overseas, the highest in the world. Ambassador Liu introduced the two centenary goals and the Chinese dream of the great renewal of the Chinese nation for the future, as well as the initiatives of China to deepen reform and further open up, transform the growth model, improve social management, advance people’s well-being and ensure sustainable development and environmental protection. 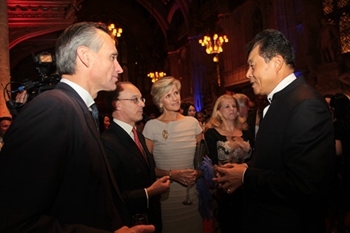 Ambassador Liu reviewed the growth of China-UK relations over the past 65 years. He pointed out that compared with 60 years ago or even 10 years ago, China-UK relationship has never been so deep and broad and the achievements of our relations are unprecedented. The Ambassador listed the highlights in the current China-UK relations: The two countries now have annual prime minister’s meeting and three pillar mechanisms: the economic and financial dialogue, the high-level people-to-people dialogue and strategic dialogue; Britain has become China’s second largest trading partner in EU; The total of Chinese investments in Britain in the recent three years is more than the combined volume of Chinese investments in Britain in previous 30 years; London has become the largest offshore RMB center outside Asia and the RMB will become one of Britain’s reserve currencies; the two countries have set up a joint innovation fund worth 200 million pounds; Britain is the largest European host to Chinese students and is only second to the United States worldwide; there are 25 Confucius institutes and 94 Confucius classrooms across Britain, more than those in any other European countries; and the sixth China-UK Economic and Financial Dialogue created a record of 73 outcomes. In conclusion, Ambassador Liu said that as Chinese ambassador to the UK, he has two dreams: First, to achieve greater prosperity of China and realize the Chinese dream of the renewal of the Chinese nation. Second, to see China and the UK become indispensable partners of common growth and inclusive development, and to see continuous advancement of our cooperation in a wide range of areas bringing greater benefits to our two peoples. He believed that the realization of the Chinese dream will offer great opportunities for China-UK cooperation and raise China-UK relations to a higher level. 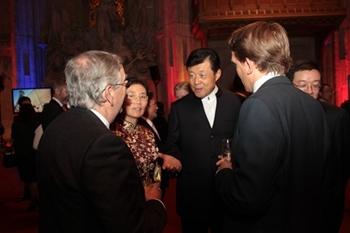 Meanwhile, China-UK win-win cooperation will help China achieve the two centenary goals. By working together, we can make both dreams come true. Baroness Anelay of St Johns, Minister of State for Foreign and Commonwealth Affairs, delivered a speech on behalf of the British government. She extended warm congratulations on the 65th anniversary of the founding of the People’s Republic of China and expressed admiration to China’s development achievements. 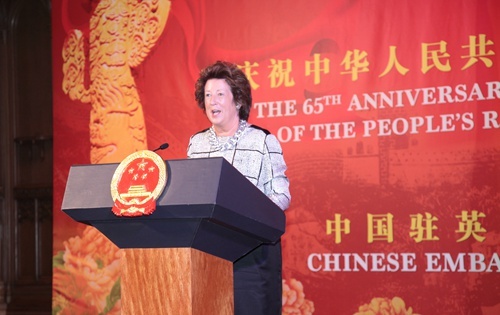 Baroness Anelay said that the UK and China are building on their long history of cooperation and solid foundation of bilateral relations to go deeper and wider. She was pleased to see the unprecedented and rich outcomes from the many major events in the UK-China relations in the past year. The two countries held two annual prime minister’s meeting, two rounds of economic and financial dialogue, a new round of high-level people-to-people dialogue and strategic dialogue. Through these mechanisms the two sides are working together to create a partnership for growth, innovation and reform. The UK and China are moving towards the goal of bringing bilateral trade to 100 billion US Dollars by 2015. They are deepening exchanges and cooperation in various fields, including education, culture, science and technology, innovation and tourism. And they have set the year 2015 as year of UK-China cultural exchange. 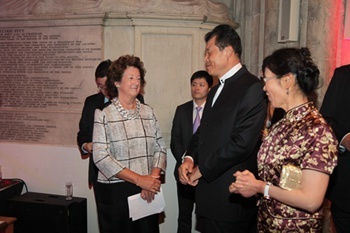 She hoped that UK-China relations will maintain a good momentum of development and generate more outcomes. 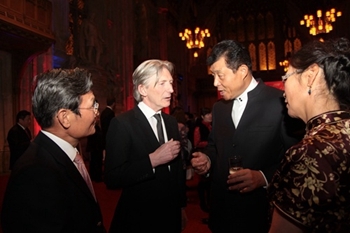 The guests of the reception hailed the achievements of new China in development and echoed Ambassador Liu’s wish to achieve both the Chinese Dream and an indispensable partnership between China and the UK. They expressed their willingness to continue to play an active role in their respective fields and promote greater development in the China-UK relations and cooperation in various fields. At the reception, a brass band from the London Academy of Music and Dramatic Art played cheerful Chinese and British music. The Chinese students studying in the Academy presented to the guests a wonderful performance including piano and tenor solos with Chinese features. Also at the reception the promo entitled “China Today” was played and fine books and pictures on the “Chinese Dream”, China’s economic and social development as well as history, culture and diplomacy were handed out to the guests. 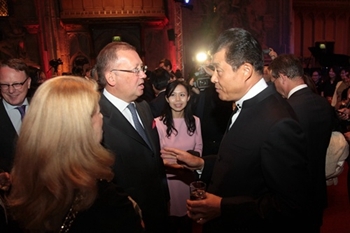 The reception was attended and reported by representatives from the mainstream British media such as Financial Times, The Economist, Daily Telegraph, Daily Mail, The Independent, Reuters, BBC and ITN, Chinese central media such as People’s Daily, Xinhua News Agency CCTV, and other local Chinese media such as the Phoenix TV, European Times and UK Chinese Times.